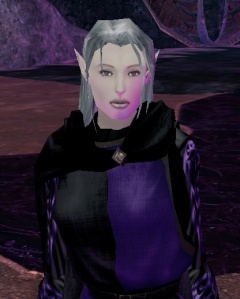 Lilliana Be'letane is an Ysgardian Aeromancer, currently living in Mikona. She is known as the Great Mage of Internal Affairs of the Violet Order, and as the inventor of a commercially available device for breathing underwater. As a Moon Elf, Lilly is pale skinned, with silver-grey hair. She stands little over five feet tall, with a very slightly stooped posture, likely from too many hours spent hunched over a desk. She is generally appears disheveled, with unkempt hair and little obvious effort spent on the way she looks. She is very rarely seen in any clothing other than a practical full length robe in Violet Order colours, with the insignia of her Order and stylised lightning bolts embroidered on the left shoulder, and the mark of Andrinor's Trust embroidered on the right. She also wears a fine black cloak with a black metal clasp in the shape of a lightning bolt, hard-wearing gloves made of fine black leather, and a intricate ring studded with pulsating black gems. She is rarely seen carrying much in the way of weaponary, though recently she is seen with a dagger sheathed horizontally at the small of her back, concealed but sometimes visible in outline beneath her cloak. Occasionally she is trailed by a pair of birds - a raven and a hawk - with tags around their legs naming them "Huginn" and "Muninn". She tends to refer to both of them as "Bird". She has a slightly squeaky voice and frequently speaks too quickly for casual listeners' comfort, with a hint of a M'Chekian accent. Lilly is originally from the isle of Hala, Ysgard. Born to Elven parents in the city of Nagritch, her youth was largely uneventful. Both parents being graduates of Nagritch University, she was encouraged from an early age to learn the art of Wizardry, which she took to with gusto and showed aptitude for the art, graduating from the School of Illusion and completing a post-graduate course at the School of Evocation. She continued to live in Nagritch for many years, a period of time which saw some upheaval on the Island of Hala, until wanderlust took hold and she left home to explore the wider world, particularly intrigued by other planes. The most easily accessible being one she heard talked about frequently - Avlis, a prime material world. Having travelled to Avlis, Lilly set about learning about the world around her - how it differed from her home, and how it was similar. Lacking the properties of the plane of Ysgard, the incidence of undead in the world came as something of a shock, but nothing that couldn't be taken in stride. She explored the cities and countryside of Southern Avlis - Elysia, Mikona, Le'or T'nanshi - and took a particular liking to Mikona, the bustle of it's streets and prevailing political climate reminding her greatly of Nagritch. After a short stay it became clear that something major was different on this world - Magic seemed to work completely differently than she was used to. This revelation led to research and exploration in to the why and how of it, and she became interested in Andrinor's Trust, and the history of Mortal Magic on Avlis. Of particular interest was the Nine Mage Orders - no similar arrangement existed back on Ysgard - and the advanced magical techniques Andrinor grants to those that embrace his Trust. She became particularly enamored of the idea of being part of a Mage Order, and decided to stay on Avlis for the forseeable future to complete this aim. She took the exams required for membership of the Trust and joined the Red Order of the Flame, settling in the Order's newly constructed tower in Mikona. From here, she began researching what was to become her great love - Aeromancy. Under the tutelage of Sarrena Sunflower, a Halfling mage of the Green Order and alongside fellow apprentice Vilne Elor, Lilly began to study Aeromancy, the art of casting electrical elemental evocations and conjurations. Electrical spells had long been a favourite of hers - Lightning Bolt and Scintillating Sphere were staples of her Evocation studies - and grasped the opportunity to study electricity more closely, and use it as her primary magical weapon. Her early tuition was successful, despite her complaints at Sarrena's love of making her apprentices write endless essays, and she eventually took the first of many steps on the long road to mastering the art. Becoming a journeyman Aeromancer, she left Sarrena's tutelage to follow her own path of research and experimentation, with wildly varying degrees of success. Many of her experiments ended in disaster - some with explosions and the attendant fines - whereas others led to fascinating breakthroughs, and the discovery of potent new techniques and their practical applications. The most drastic of these breakthroughs came as part of a call to arms in M'Chek - the undead monster Lord Kale and his legions of Death Warriors had plagued the nation for months, but finally, after several hard fought battles, the location of his secret island fortress had been obtained. A daring secret raid to cut out the heart of his operation and destroy the Lord himself was planned, with mages from many orders gathering to help devise and implement the plan. Some mages focussed on the preliminary bombardment of the island before the main assault, others on scouting island, and others still on how to destroy Kale once and for all when he had been defeated. Lilliana, meanwhile, focussed on the means of staging a surprise attack on an island - ships would not do. An idea was formed - to walk to the island, along the bottom of the sea. To this end Lilly began experimenting with methods for breathing underwater. She quickly discovered that the presence of an Air Elemental would allow people to breathe - they could breathe the elemental's very essence. Obviously, equipping an entire forty-person attack force with an air elemental of their own would be impractical. Instead she devised a means of trapping the vital essence of an air elemental and encasing it in a specially designed tube of glass, capped with brass. Precision-designed valves and tubes allowed a bearer to inhale the essence within, thereby allowing them to breathe underwater. Lilly, in her enthusiasm, declared that this invention had defeated water itself, and named it to reflect this fact. The assault on Kale's island fortress, assisted by the water conquering field generation matrices, went off without a hitch, though Kale himself escaped. Immitations of Lilliana's original design for the Water Conquering Field Generation Matrix have been made publically available by Humphrey in Port Eridanus, Ferrell. It's continued success is a point of pride to her, though she grows irritable and refuses to comment if questioned on the subject of royalties. She can occasionally be seen remonstrating with the unfortunate Hin about it. Lilliana Be'letane in her natural habitat. Some time after the assault on Kale's fortress, Lilliana began to encounter increasing idealogical differences with her fellow mages of the Red Order, a feeling which was shared at the time by Vintrinia Carnen and Gurth Istar. Having decided that the Red no longer fitted her outlook on the world, she began to look for a different Order to join. She examined several, before finally settling on the Violet - their stated aim of seeking Mastery over their chosen arena and their surroundings appealed to her. Contacting Dameon Nepirtas, then Great Mage of Internal Affairs of the Order, she set in motion the process of transferring orders, requiring her to complete a variety of tasks for Dameon to prove her desire to move. Upon her success she was granted full membership of the Violet Order. As a member mage of the Order, she has strengthened her friendship with the ogre mage, Orfanos, an acquiantance from their time as members of the Midnight Mercenary Company. She has also worked with the preeminent Sereg'wethrin artificer Alaren Tre'lanin on several projects of interest to both of them. She remains a member of the Violet to this day, and is active in training up and coming Evokers, particularly those with an interest in Aeromancy. As the Great Mage of Internal Affairs for the Order (having personally petitioned The Master for the position after Vandrammes' transfer to Ka-Kimon), a large portion of her time is spent administering to it's day to day running, including handling recruitment and disciplinary issues. As part of her continuing research and development of the art of Aeromancy, Lilly has undertaken a variety of research projects. On a trip to the Quasi-Elemental Plane of Lightning, and in particular the city of Stormfront, she conversed with the eldest electrical elementals and Djinni that she could attract the attention of, and in so doing discovered information that helped her solve the final puzzles in mastering the art of Aeromancy. She continues to hone her skills and develop the art as much as possible, helping to adapt Vintrinia Carnen's breakthroughs in the field of Elementalism for use with Aeromancy techniques. She currently holds the unofficial and largely symbolic position of Master Aeromancer within the Violet Order. Together with old fellow apprentice Vilne Elor, she is counted as one of the foremost Aeromancers in Southern Avlis. Her research notes are publically available. She has regularly tried to take on formal apprentices to pass on her knowledge. 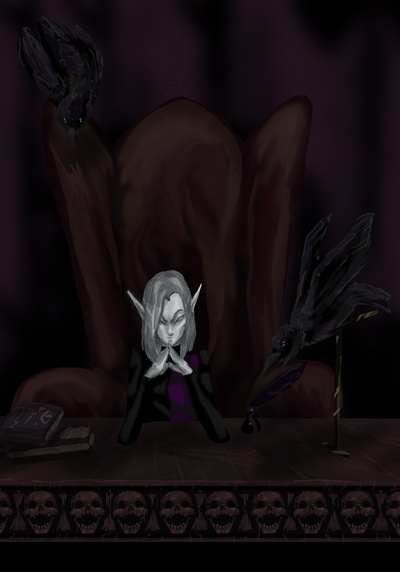 Having taught the conjuror Neeb the basics of Aeromancy before his departure from Southern Avlis, Lilly is now looking for new apprentices to teach, beyond those in the Violet who show an aptitude for Evocation. When a nature spirit calling itself Reed delivered cryptic clues to the Trust orders about an artefact of power, it fell to Lilly to decipher and interpret the Violet's share of the prophecies, ably assisted by Orfanos and the White mage, Solveig. Upon woirking out the first fragments of prophecy, they discovered that to access the Violet's fragment of this artefact - a staff - a key would be required. Learning it's location, concealed in a fortress deep within the Underdark, Lilly invited Orfanos to join her in mounting a full scale assault on it and it's occupants. Leaving the place a shattered ruin of it's former majesty, the pure ice key was recovered. The next part of the journey - recovering the staff piece itself - took Lilly and her companions to a glacier, concealing an ice-filled cave. 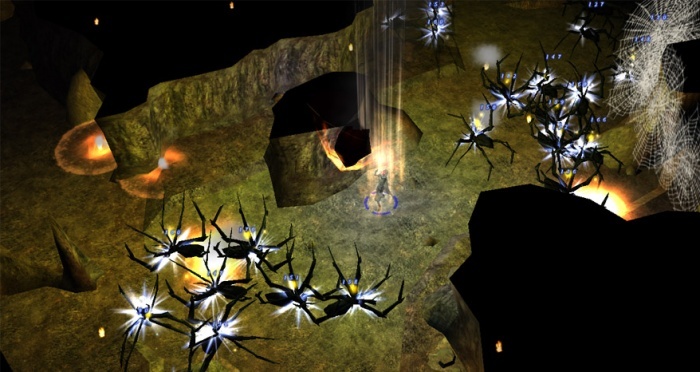 Having battled through a tribe of frost giants (much to Lilly's dismay, as fire-vulnerable creatures are so very common), they reached the heart of the cave. There they encountered the "Lady of the Glacier", who handed over the heel of the staff. The staff was then assembled through a series of rituals conducted by other members of the Trust. The next stage of the quest involved trips far and wide to magical towers and other locations of significance, seeking the empower the many gems that studded the artefact's surface. One trip to a pitch-black tower was particularly memorable, involving the recovery a Phoenix and the appearance of a familiar-looking shadow creature. Another, a trip to an island inhabited by strange sea creatures, would also stick in the memory. With the staff finally at it's full strength, it was put to it's purpose in an attack on the ancient cursed realm of Hel'byssia, which is documented more fully elsewhere. With the creature that was once Silialath destroyed, Lilly's involvement in the matter ended. This page was last edited on 29 June 2016, at 23:17.